senior handicapped man in wheel chair sitting at a table with cup of coffee talking on a mobile phone and uses a laptop in a restaurant. Young and pretty woman sitting on chair near kitchen table with cup of coffee on it and talking phone. 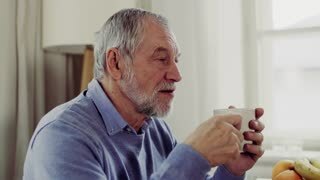 A senior man with a cup of coffee sitting at the table at home, talking to somebody.